Making Rivendell in the Desert: More Elven Cloaks: Tips and Tutorial How to Sew a Lord of the Rings Half Circle Cloak. I'm in the middle of a mad sewing dash, trying to finish outfits for Halloween. AND I SEWED 2 ELVEN CLOAKS! I love how the hood turned out. This one was unlined, but the fabric was thick enough that it worked really well. I had promised my twin to make cloaks for her and her roomate for a Halloween party. I thought, half-circle cloak? I got this totally figured out. I learned a lot, I think I've perfected my cloak making technique now. First, I used the Medieval piecing technique to get the half-circle cloak long enough. Last time, I had used 55" wool, and cut that into a half-circle with a radius 55". But I had not accounted for the neck hole (radius 8"), and thus ended up with a cloak only 47" neck to shoulder (after hemming, perhaps 46"). It showed off my awesome boots (too large hand-me-down snow boots with twill tape wrapped around to keep them from flopping. Looks kinda like the boots in Skyrim), but was a bit shorter had wanted. So this time, when making cloaks for my twin and her friend, I was determined to use the piecing technique. See how the "pattern" is wider than the width of the fabric. So you piece in the back edge. (I just haphazardly drew my pieces, depending on how big your semicircle is, you can find the best arrangement for the pieces. You could do it with one piece or as many as you need. It worked really well. I made my twin's cloak, cutting it with a initial radius of 62-63" (using piecing to fill up the edge on the bottom, like the Medieval example above), with the 8" radius cut out of the top for the neck, I ended up with a shoulder to edge length of 54-55". At my 5'4" height, this brushed the ground. I ended up cutting 3" or so off the bottom and getting a nice length of 51"-52". I thought it ended in just the right spot. For the closure, I used 2 metal rings we had made from a hanger (instructions here,[ insert link]), and brown cotton canvas I sewed 2 layers together, then flipped inside out and ironed to make an "applique". 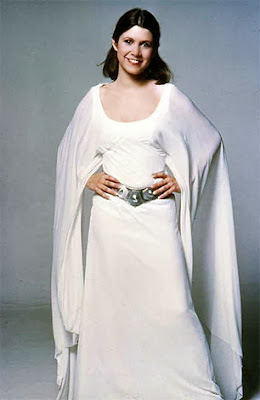 I then handsewed this to the cloak, and sewed the rings onto it. Its then an adjustable opening, with a leather strap. I did a little quick leave embroidery on them. And here's a few more glam shots of it. Ignore my silly expression. Note the beautiful drape of the cloak. I LOVED the drape of this fabric. It looks like linen, although its actually 100% cotton. It's medium-heavy weight is matched with a loose enough weave, that it drapes really well (unlike canvas, whose tight weave keeps even its heavy weight draping stiffly). I dyed it to its current elvish color myself, with dark green RIT dye, and extremely hot water and salt. Sadly, I didn't get the best pictures of this. I was up till 11:30 last night finishing the Princess Leia dress, and then spent all morning/early afternoon sewing up these cloaks. Then I had 2 minutes to snap pictures, and then we rushed to the post office to mail them before they closed. Hence I didn't get to show off the drape as well as I wish. Just trust me, it looks awesome. For the neck-hood attachment, I knew I needed at least a few pleats in the cloak, so it wouldn't pull so hard on my shoulders like my wool one did. I put 2 pleats in on each side, approx 5" from the neck opening, and then another 1" away from that. Each pleat was about 1/2" thick, "eating up" about 1" each. See diagram. It worked really well, just enough ease in the shoulders that it didn't pull funny, and yet not so fitted (like a bag) that you lose the cool sweep of the half-circle drape from the shoulders. This one, I had some adventures. First off, I didn't have enough cloak fabric for 2 cloaks, so I went to walmart, where the only thing I could find that could possibly work, was a beautiful deep forest green fabric that was sadly, rather light-weight (quilting cotton weight) but was 100% cotton, claimed to be 44/45" wide, and had this beautiful soft feel to it. I bought 4 yards, and washed it on hot and dried it in the dryer to shrink it. Well, I knew with multiple washings/wearings it would soften over time. Theoretically. Praying. But the color was gorgeous and we didn't have time to go back to the store. Then I measured it. It had somehow shrunk (?!?) to 38.5" from its vaunted 44/45". I had a brief freak out. I tried to cut creatively, to piece, etc, but there just wasn't enough fabric in the 4 yds. In the end I ended up with a cloak 47.5" from shoulder to hem, just a smidge longer than my wool cloak. I was sad. But it still works, and shows off your boots. I think Faramir's cloak hit him about there too. So that was the sad part. You see the facing strips down the front. And how awesome the hood looks. Ignore the weird faces, I was tired. Strangely enough, it seems it did come down a lot longer than I thought it would. Interesting. I really like how it looks when the hood is down, how it falls and the brown peaking out. How the hood looks down with the cloak thrown back. Ignore the face. I went a little crazy with the applique. 2 layers of brown broadcloth, cut and sewn in the shape of a leaf, flipped inside out to hide the seams, hand embroidered. Also to make up for the cloaks other problems, I used a fancy clasp that adds instant class. I tried to mirror the leaf theme with the applique. I was quite pleased with how my embroidery turned out. And how the clasps mirrored the effect. When I was done, I noticed it didn't seem as short as my wool cloak. Perhaps I used a lot more in the hem of the wool cloak, making it shorter. With this cloak I used very narrow hems. Stabilize the front opening. Fold over/hem the front opening twice, or better yet, sew a facing onto it (that folds under, enclosing all raw edges and sewn down on the inside) to stabilize the drape of the front opening. Bag Line the hood. It looks really good. Especially if you do it in brown. When Sewing the hood to the cloak, sew it with a facing strip, then fold down the facing strip over the raw edges, enclosing everything nicely before sewing it down. No scratchy raw edges at the neck! For a 5'4" person, a shoulder to hem length of 51-52 is nice. Keeping circular hems as narrow as possible and try not to stretch as you are hemming, it keeps it from going all rumply. Don't trust the bolt when it says 44/45", bring your measuring tape and measure it. And if you do get 45" wide, buy at least 4.5 yards. 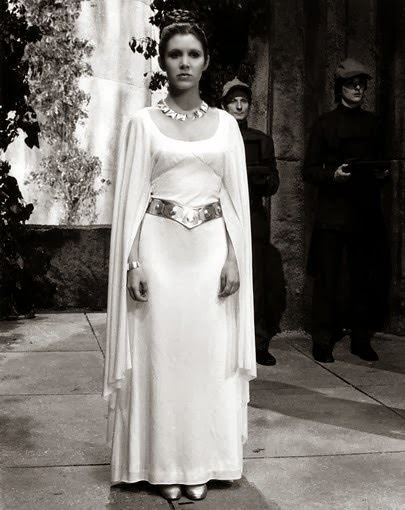 I finished a (gorgeous) rendition of Princess Leia's Ceremonial Dress for my sister in law. I improved the bodice and sleeves from the original design, in my humble opinion. I actually inserted in invisible zipper, drafted double French darts and (drumroll) SEWED WITH CHIFFON!!! 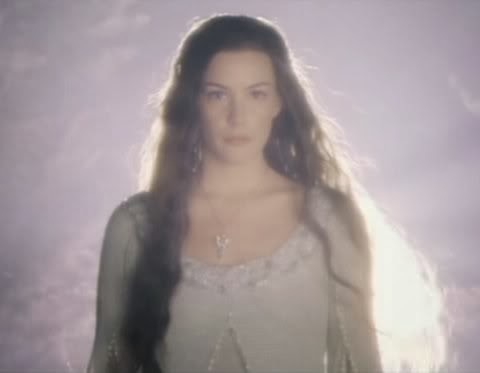 And to me, it looks kinda like Arwen's angel dress. The first fabric is a medium weight cotton, it's thicker than usual "100% cotton 45 inches wide" stuff (often called "quilter's cotton", the stuff my 2nd cloak was made of) you would get at Walmart or Joanns. Most cottons are lightweight. The thing with medium weight, is its heavier, basically, it drapes better because the threads its woven out of are thicker (if you pull a few threads out of a cut end, you'll see they are alot thicker than the threads of quilting cotton fabric whose threads are fine and tightly woven enough its hard to pull a bit out. If its easy to pull a thread out, if you can see the gaps between the threads, it means the fabric is medium weight. If you are really stumped, just unroll some from the bolt and hold it up, if it falls nicely down like a cloak, its a medium weight. If it sorta looks stiff and lightweight, it's lightweight (like quilter's cotton). What makes something have good drape is its thread weight/weave tightness ratio. Lightweight fabrics (from lightweight threads) can have good drape if they are woven loosely. However, tightly woven fabrics need heavier threads to hang nicely. So things with the least drape are made from thin threads woven tightly (quilter's cotton). I got my medium weight cotton at a discount fabric store (they sold upholstery remnants and things for $2/yd) alas, only I think in Philadelphia (the name was JOMAR). Now I'm in Phoenix, and there's something similar to it called "SAS Fabrics by the pound". The only thing with those places is often you have to hunt around and things aren't always well organized. Google "discount fabric stores" (or "fabric remnant stores" ) in your area and see if there's something like it. This does require time though. Joanns can be pricey, they give out coupons for 50% a single item, etc, if you subscribe to their email list on their website. That also means that everything has to be priced higher, sadly. But if you go that route, definitely get some 50% coupons. Anyway, the problem with quilting weight cotton (as you could see in the 2nd cloak) is it isn't heavy, so it doesn't drape as nicely. -look for a medium weight fabric. If you have money to blow, Linen and wool are the way to go. Linen is usually always medium weight. Alas, it is also more expensive (usually runs around 7-15 bucks a yard) but its usually always medium weight. Wool is always heavier. If you are going cheaper, fabrics with polyester in it are naturally heavier (they are also less absorbent of sweat and things, and make sure its not made from threads spun so tightly that its like a plastic sheet), so you might find something with good drape with that. -look for "linen look" cloth tablecloths or drapes on clearance or at a thrift store. (Thrift stores often sell old curtains and sheets really cheap). Drapes are often meant to look like they are made from linen, which they do with cotton in thicker threads, which is what you want. -just get quilting cotton, but buy 2x as much, and line the entire cloak. (Just cut out 2 identical pieces, stack them together, and treat them like they are one). This makes the fabric 2x heavier, and it will hang just like medium weight cotton. This actually works pretty well, I think if I'd bought 2x as much quilting cotton for teh 2nd cloak, and just lined it, it would have ended up looking pretty close to the 1st one. If you are on a time crunch, this is the cheapest and best option. Especially if you make it from 2 layers of thrifted sheets (and not sheets are equal. Some sheets are stiff and tightly woven, others have gorgeous drape. Just hold it up and look at it.) The nice thing with shopping used linens is all the starch is washed out and its easier to get a sense of how it will hang. also, if you are planning to dye it (RIT dye is with the laundry detergents are Walmart), try to get 100% cotton (or linen) as they take dye, when polyester really doesn't. You'll see how with 'medium weight' you can sorta see how the threads are thicker/looser woven. THANK YOU SO MUCH for all the Info that I will definitely use !!! Looking forward to making your first cloak today :) It’s my first long cloak and I also found the midevil piecing technique just awesome! Also the pleats at the neckline, do you have a minute to describe how physically that is done in more detail. Do you just pinch the fabric one inch apart and sew a dart basically on each side 5 inches from the front opening? Then sew the hood on? Yes, I am lazy enough I don't even sew a dart, just a pleat, I just pinch the fabric there, put a pin in it, and sew over it to hold it down, before sewing on the hood.